Avid outdoorsman. Guns, knives and motorcycles. TargetRockLeather replied to Alexis1234's topic in How Do I Do That? Oh ok then. I was just concerned because I had this vision of a perfectly good tool being ground away If you need to change the angles (re-profiling) that's a different story. TargetRockLeather replied to ABHandmade's topic in Show Off!! WOW! that is truly incredible. It's even more impressive now that I know how it was done! Thank you for explaining. In my opinion, you should NOT use a belt grinder on a knife you care about unless it has significant damage to the edge. Belt grinding removes more metal than should be necessary. Small chips and dings should be removed with a stone. If the blade is in really bad shape, use a sanding block and work your way up to 1000 grit paper. If the blade edge is in good shape, don't use a belt grinder! Use a stone if it's dull and finish it with a leather strop. Keep using the strop as you use the knife to prevent it from getting dull again. I know I'm going to sound like an idiot, but I have to ask... how was this done? I mean, it looks like it came from a photo but how was it applied to the leather? TargetRockLeather replied to TargetRockLeather's topic in How Do I Do That? No sir. Only neatsfoot oil. The surface is rather rigid but that is caused by the wet forming of the bend. Once it dries the leather is more rigid. Skiving is a brilliant idea. I never would have thought of that. I’ll do a prototype like you said and let you know how that goes. Thanks a lot! Actually it makes perfect sense. The leather I'm using is at least 7-8oz. I just realized you can't tell what the size of the pouch is from the picture. The flap is about 2" wide and 3 1/2" long including the bend. It's not lined but it is rather thick. I thought I was doing the right thing by wet forming the bend. But after reading your explanation I realize I might be shooting myself in the foot. If I understand your suggestion correctly, you're saying to go ahead and wet the leather but only bend it about half way and let it dry that way? The way I did it the flap was fully closed. Or maybe I should try not wetting it at all? Thanks for the quick response. 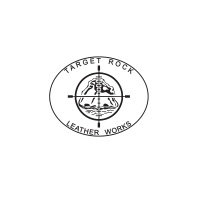 TargetRockLeather posted a topic in How Do I Do That? When I make something like a pouch with a flap, or a strap or anything that has a sharp bend, the leather wrinkles when the flap is opened. When I first made the flap, I moistened the leather so that it doesn't crack. It looks great while it's closed, nice and smooth. After it's dry, and any time after that, when I open the flap, it resists being straightened out and the finished side of the leather wrinkles badly. I've tried using a generous amount of neatsfoot oil to make it more flexible, but that doesn't help. I was wondering if anyone has any tricks for dealing with this. The picture shows an example of what I mean. Thanks for that explanation. I'm going to give that a try. I give mine a quick strop before and after each use. If you get in the habit of doing that it will stay sharp. Leather is really tough on a blade, so even if you get it as sharp as everyone is describing, it will quickly dull if you don't maintain it. Not a bad idea. I could just glue something together and send it for him to try. I was thinking of making a model from the drawing out of wood and using that to fit the sheath. The reason I want to solve this problem is that the guy is planning to make and sell axes. So I don't want to turn him down without trying. A guy has asked me to make an axe sheath for a hand forged Viking axe. He wants to send me a "detailed drawing" from which to make the sheath. He's on the other side of the country so shipping the axe to me isn't a cost effective option. Has anyone had any experience working from a drawing? I'm really not confident that I can make a sheath that fits properly without having the item in my shop. I'm not planning on wet forming it, so that's not going to be an issue. Any suggestions? I have a CS Osborn #66. Their website lists the weight as 14 oz. I don't think I'd want it to be any lighter than that. It's still rather small as hammers go. I chose this one because it seems to be popular with leather workers, and I have no complaints about it. I bought mine on Ebay new for $35 USD. You might be able to find something used, but if you do make sure the face of the hammer is absolutely smooth and don't ever use it on anything other than leather. Any dings on the face could be imprinted on your project. sheathmaker: That's a beautiful sheath. I'm not familiar with the term "split toe". I'm assuming that the way it's stitched along the spine of the blade is what makes it a split toe design? What is the advantage of that over simply folding the sheath in half and letting the full length of the blade spine rest inside the crease? From the photo it looks like the blade spine and handle are in a straight enough line to do that with.